Rajmachi (Udhewadi) is a small village in the rugged mountains of Sahyadri in India. The fortification at Rajmachi consists of two forts, namely Shrivardhan fort and Manaranjan Fort. Rajmachi Fort is a popular trekking destination. It is a very famous fort located near two famous hills of Maharashtra, Lonavala and Khandala. It is about 15 km distance from Lonavala. Historically, Rajmachi fort was a strategic fort to control Borghat (ghat between Khopoli and Khandala on Mumbai-Pune route) which was a historical trade route. Rajmachi peak has two fortified structures - the Shrivardhan fort and Manaranjan fort. Rajmachi can be reached by 2 ways, the tough route is from Kondivade village near Karjat and it involves climb-up of about 2000 feet. The other route is from Lonavala, which is almost a plain walk of about 15 km. In rainy season this region all the more beautiful with silvery waterfalls, streams and lush green forests and meadows. 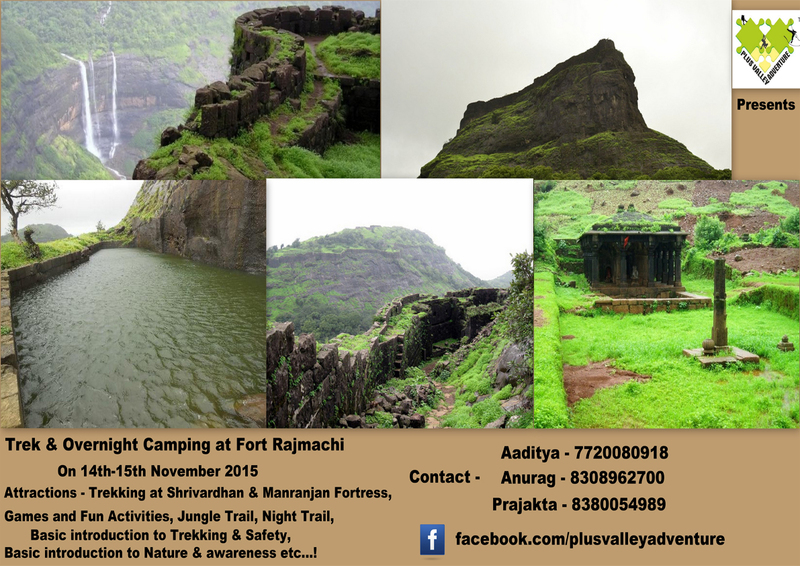 Event Location – Fort Rajmachi, Lonavala. Meeting Time – 06.00 am. Members from Mumbai can join the event from Lonavala. 4. Trekking shoes and Floaters/Sandals. 12. Dry Snacks/Biscuits/Chocó Bars/Dry Fruits etc. 06.00 am – Meeting Point – Shivajinagar Railway Station. 12:30 pm - General Informative sessions about Safety during trekking & climbing, Wildlife, Flora & Fauna, Nature etc.